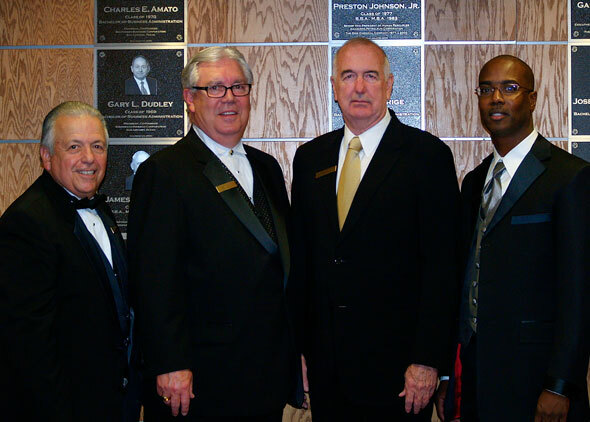 COBA Hall of Honor inductees for 2009 include Jack Parker, T. Tolbert Chisum, William F. Garrison and Roland Hendricks. They are the ones who bring honor and distinction to Sam Houston State University through their personal and professional achievements and their valuable contributions to the business world. They are the representatives of the success of the College of Business Administration program at SHSU, the ones who reflect why it’s such a great program to be involved with at the university. It’s only appropriate then, that they belong to the Hall of Honor in the College of Business Administration. Honorees inducted to the hall this year at a dinner were Jack C. Parker, T. Tolbert Chisum, William F. Garrison and Roland Hendricks. The fourth annual ceremony included a dinner in their honor and a presentation of the Hall of Honorees video and plaques given to the recipients. Jack Parker graduated from Sam Houston with a Bachelor of Business Administration degree in accounting in 1964 and earned his Masters of Education degree from Texas A&M University in 1969. Following a brief career in public accounting, he returned to SHSU in 1967 as associate director of admissions, became business manager in 1969, comptroller in 1973, and completed his public accountant certification in 1977. He retired as vice president for Finance and Operations Oct. 2, 2008, after 42 years of dedicated and distinguished service to Sam Houston State University. Parker is president and CEO of 4P Investments. Thomas Tolbert Chisum, chairman and CEO of the Abraham Lincoln Presidential Library Foundation and managing director of business development with Wintrust Financial Corp. graduated with a Bachelor of Business Administration degree in 1967. He was an original investor, founder and member of the board of directors of North Shore Community Bank & Trust Company in 1994, after spending almost 30 years with Aetna in various marketing and senior management positions. Chisum served as president of the SHSU Alumni Association in 1979 and was named a Distinguished Alumnus in 1987. William F. Garrison is a retired major general of the United States Army. He graduated with a Master of Business Administration from Sam Houston State University in 1973, having completed his undergraduate work at Pan American University. He entered the U.S. Army as a private in July 1966 and was promoted through the ranks as colonel, brigadier general and major general as the youngest officer to hold those ranks. Garrison served the majority of his career in classified assignments. He retired from military service in 1996 and now serves as chief executive officer of RCT International. Roland Hendricks began his professional career with the Dow Chemical Company in 1980 as a staff accountant in the cost and terminal accounting department. He now holds the position of Texas manufacturing controller. He has actively recruited SHSU business graduates for the Dow Chemical Company and has supported the College of Business Administration through scholarship and room sponsorship contributions. He has also served on the COBA advisory council. He is an ordained minister and pastors the Great Mount Zion Baptist Church in Brazoria. He and his family live in Lake Jackson.